“Not everyone who says to Me, ‘Lord, Lord,’ shall enter the kingdom of heaven, but he who does the will of My Father in heaven. Many will say to Me in that day, ‘Lord, Lord, have we not prophesied in Your name, cast out demons in Your name, and done many wonders in Your name?’ And then I will declare to them, ‘I never knew you; depart from Me, you who practice lawlessness!’ “Therefore whoever hears these sayings of Mine, and does them, I will liken him to a wise man who built his house on the rock: and the rain descended, the floods came, and the winds blew and beat on that house; and it did not fall, for it was founded on the rock. “But everyone who hears these sayings of Mine, and does not do them, will be like a foolish man who built his house on the sand: and the rain descended, the floods came, and the winds blew and beat on that house; and it fell. And great was its fall.”(Matthew 7:21‭-‬27 NKJV). “The heart is deceitful above all things, And desperately wicked; Who can know it? I, the Lord , search the heart, I test the mind, Even to give every man according to his ways, According to the fruit of his doings. (Jeremiah 17:9‭-‬10 NKJV). 13 Forbearing one another, and forgiving one another, if any man have a quarrel against any: even as Christ forgave you, so also do all of you. 15 And let the peace of God rule in your hearts, to the which also all of you are called in one body; and be all of you thankful. 17 And whatsoever all of you do in word or deed, do all in the name of the Lord Jesus, giving thanks to God and the Father by him. 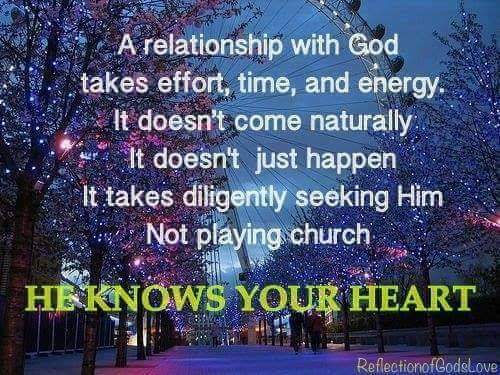 This entry was posted in Daily Message and tagged GOD KNOWS YOUR HEART, you can't fool God.